For prospective Virginia solar customers new to solar energy, there are a lot of unknowns about getting solar panels installed at your home. How many panels do I need for my roof? How durable are the panels? How much money can I save with a system? Can I trust POWERHOME Solar to do a good job? Why is Virginia a good place for solar? Those are probably just some of the questions running through your mind before meeting with one of POWERHOME Solar’s field energy consultants. 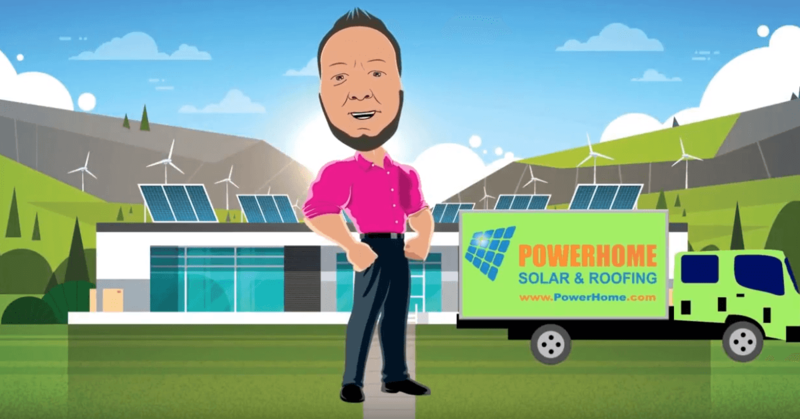 POWERHOME attempts to take the mystery out of its process with a fun but instructive five-minute cartoon tutorial narrated by POWERHOME CEO and co-founder Jayson Waller. The video lets you know a little bit more about how we do business, who we’ve done business with and the 10 steps that happen when you say “yes” to solar. We do everything in-house to best manage quality assurance and customer satisfaction, and to help local economies thrive by hiring area residents. Watch and learn! If you don’t remember all 10 steps from the video, we review them below. 1. Meeting with a field energy consultant. One of our representatives comes to your home, takes pictures and gathers information, including your power bill. We customize our design and proposal based off your specific needs. 2. Design team. A professional design of what your panel array will look like is sent to you for approval. 3. Obtaining a structural letter. This allows us to verify that your roof can accommodate solar panels. 4. HOA department. If your neighborhood is governed by a homeowners association, we work to get its approval. 5. Interconnection. We work with your local power company to interconnect with its service, meaning you still have power at night when your panels aren’t producing any. 6. Permitting. Adding panels to your home means getting the necessary electrical and building permits. 7. Scheduling. Our team works to find an installation date that’s best for you. 8. Purchase order team. Your home’s order is loaded and prepared on a truck. 9. Installation. Our team gets the panels on your roof or ground-mounted array. 10. Power company comes out to do a meter swap. This is done so you get credit for excess energy production from your panels, a process called net metering. After the meter swap happens and you’re turned on, congratulations, you’re enjoying solar power! We hope our video eliminates many of the questions potential Virginia solar customers have about POWERHOME’s process. Our growing solar education library may be able to answer many more. Thousands have trusted us with their installs, including the show Military Makeover and the NFL’s Detroit Lions, and we want your home to be the next one we work on. Please feel free to fill out the form below or contact POWERHOME Solar at 800-765-2715, and one of our solar representatives will help you determine whether your home qualifies for this solar program.